I'm a princess, a pirate, and I'm also just me! Her name is Eleanor Wyatt, and some days she's a princess, some days she's a pirate. Eleanor's parents have taught her she can be anything she wants to be, from a ninja to a cowgirl to a fairy with wings. She can even star in her own book! Join Eleanor and her friends as they romp through tea parties and sword fights and to discover the best treasure of all—being yourself! Author Rachael MacFarlane has been giving a voice to animated characters for more than fifteen years, on shows such as Disney's Sofia the First and The Tom and Jerry Show. She is widely known for her role as Hayley Smith on the popular animated sitcom American Dad. Also a recording artist, when she is not in the booth, Rachael spends her time with her two little princess/pirates and her husband Spencer. They live in LA with a menagerie of rescued animals. 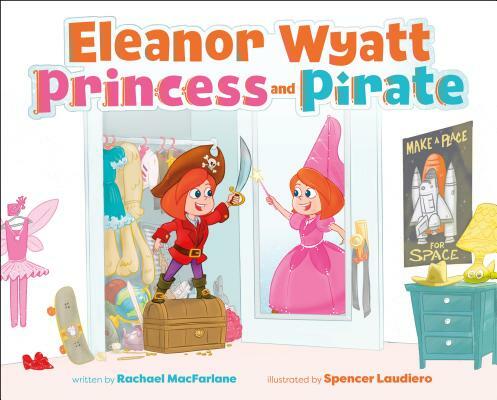 Eleanor Wyatt, Princess and Pirate is her debut picture book. Illustrator Spencer Laudiero is a graduate of the University of the Arts in Philadelphia and works in the animation industry. As a TV animation director, he has worked on such shows as Comedy Central's Brickleberry, Disney's Sheriff Callie, and Fox's Family Guy. When he is not drawing and directing, Spencer spends his time with his two daughters and wife, Rachael. Eleanor Wyatt, Princess and Pirate is his debut picture book.